On Sunday May 1st PST, we concluded our first ever external Bug Bash. THANK YOU for your amazing participation. Your feedback goes a long way and helps us prioritize the areas we want to focus our effort on in making Windows 10 better. We wanted to share some insights on the Bug Bash participation. We had 89 Quests for the Bug Bash and got great coverage on these. These Quests covered a range of topics relating to overall Windows experience, Apps, Devices, Personal, and Productive experience. The Bug Bash initially was intended for 4 days, but due to popular demand, we extended it over the weekend. 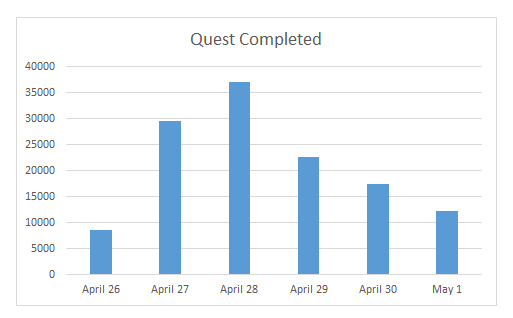 The graph shows the overall Quests completed over the course of the week. We saw the biggest participation on Wednesday and Thursday but as you can see, Insiders were engaged the whole time. One of the huge wins for having Windows Insider participate in the Bug Bash is to hear feedback from across the globe. 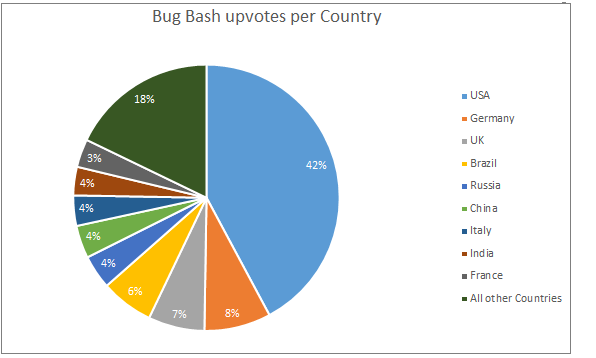 We had an impressive number of Insiders from different regions participate in the Bug Bash. We also took a look at the top 5 countries where Insiders filed the most new feedback. This is feedback where you click on ‘+ Add new feedback’ in Feedback Hub. We also had a ton of upvotes for existing feedback. This is feedback where you click on ‘upvote’ in Feedback Hub on an existing feedback. It was interesting to see that in most cases, the top countries that provided the most upvotes also had a balance of providing most new feedback. Top individuals are from various places but Spain had both the top Insiders for upvotes and providing new feedback. Many Windows Insiders gave feedback on the Bug Bash over multiple devices. 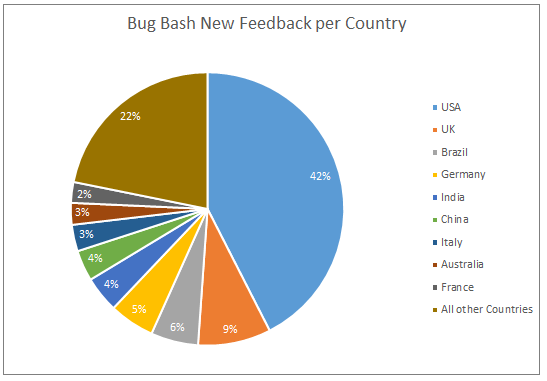 The total number of devices Insiders who participated in Bug Bash gave feedback on was 1.55. We got great feedback for the Bug Bash including the weekend. From the Quest chart above we saw a drop in engagement towards the end of the week but we see that Insiders were actively giving feedback throughout the week. 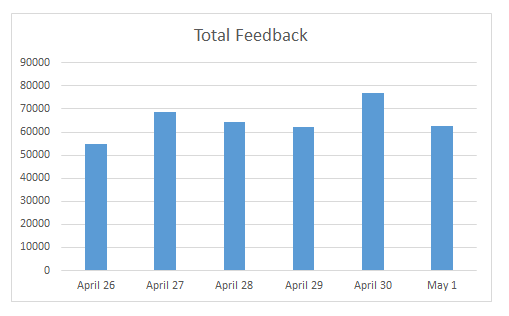 Total feedback from Windows Insider through the Bug Bash was just over 375,000! Error when playing audio: Can’t play. Another app is controlling your sound right now. To listen, close that app and try again error. Engineering teams are actively going through the feedback we received from the Bug Bash to understand the issues, prioritize them and determine what to do next. Your feedback will help prioritize what we will work on next. THANK YOU again for participating in the Bug Bash. Keep the feedback coming in the upcoming flights for Windows 10. If you have feedback on the Bug Bash or ideas on how to make it better for future Bug Bashes, leave feedback in the Bug Bash Feedback Hub feedback.